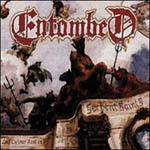 Entombed is one of the bands whose career I have been following from the very beginning and as with most of their loyal fans, I have supported them through every step of their musical evolution. Much as I enjoyed and appreciated the band�s �Rot n�Roll� era, I would be lying if I was to say that I prefer albums like �To Ride Shoot Straight And Speak The Truth� to the extreme Death Metal classics such as their debut �Left Hand Path� and �Clandestine�, so a return to heavier forms was always a welcoming prospect in my personal view. Well, after the release of the band�s latest EP �When In Sodom� a few months ago, rumors started to spread within the music industry of such a return, but I knew that only after listening to �Serpent Saints� myself would I be able to verify such claims. Well, it may have taken them quite a few years and numerous different releases, but the Swedish outfit did indeed manage to create an album that may not be able to compete with a classic such as �Clandestine� in terms of heaviness, but is not far from being regarded as the band�s most brutal release since the mid 90�s. It�s not only the fact that L-G Petrov�s vocals sound heavier than ever, but also the appearance of double-bass drumming and of old-school sounding guitar riffing that give justice to the above characterization and these elements combined with the clear and groovy sound that only Entombed are capable of producing are responsible for making �Serpents Saints� a release to be invested in by every extreme Metal fan. The atmospheric piano/acoustic guitar theme of the opening same-titled composition may for a moment have reminded of �Morning Star�, but soon an array of riffs that combine the heaviness of Napalm Death with the grooviness of Motorhead, combined with Petrov�s unholy screams will convince you that this is a whole new ballgame that we are talking about. This return to old-school forms becomes even more evident in the Thrash sounding riffs of �Masters of Death� � a song whose lyrics is a tribute to bands and albums that have helped shape the future of today�s Death Metal scene. Those of you who are already beginning to worry about missing all those great mid tempo groovy riffs should not worry: songs like �Amok� and �In The Blood� are created with such elements in mind, yet prove that Entombed�s approach to grooviness in the year 2007 is darker and heavier than ever. Being a sucker for fast guitar riffs and hyper drums I was instantly mesmerized by the mind-blowing Slayeric riff of �When In Sodom�, the brilliantly performed drum parts of �The Dead The Dying And The Dying To Be Dead� and the equally fast guitar riffs in �Warfare Plague Famine Death�, leaving �Ministry� as the only one composition of the album that I failed to relate to. Change is not always a negative thing and in the case of Entombed it seems to have worked miracles. With two new members in the band and the fresh support of Candlelight Records, the Swedish noisemakers are out to prove that almost two decades after their inception they still deserve to be considered as leaders and not followers. Are we looking at one of the best extreme metal releases of the year? I certainly think so!